Three highly acclaimed directors join together to direct three interwoven stories that take place during a journey from Central Europe to Rome. The characters connect through casual encounters and set forth a story of love, chance and sacrifice. One older businessman finds solace and a new insight into life when he is forced to wait at the train station due to bad weather. A young man is reminded of life’s obligations but is also introduced to love. And three Scottish youths on their way to the football match of their dreams are forced to open their eyes and see the bigger picture. One single train journey sparks many changes for many people. This is a film about privilege and exclusion, and the reality of the value of just one ticket. Each in his own right has earned the most Prestigious Film Award for a director: The Palme D’Or aka The Golden Palm at Cannes. 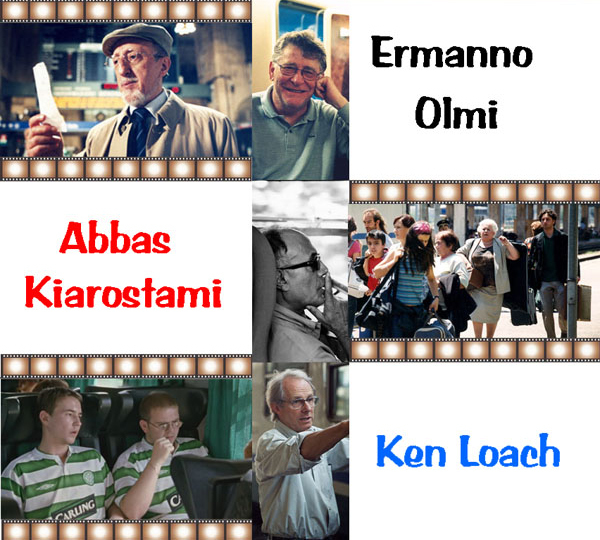 Ermanno Olmi [Italy] for The Tree of Wooden Clogs in 1978, Abbas Kiarostami [Iran] for The Taste of the Cherry in 1997, and Ken Loach [United Kingdom] for The Wind that Shakes the Barley in 2006. Now the talented Trio of Italian, Iranian and British Cinema join forces to co-direct one film entitled Tickets with three parallel plots each with its own style and set in a train that travels across Italy toward Rome. 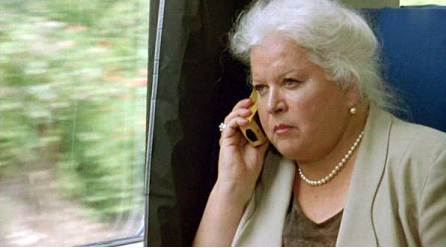 On board are a family of Albanian refugees, a professor who daydreams conversations with a lost love, three brash Scottish soccer fans en route to a match, and a complaining widow traveling to a memorial service for her late husband, accompanied by a community service volunteer who’s assisting her. Interactions among these Europeans turn on class and nationalism, courtesy and rudeness, and opportunities for kindness. Each Story has its own specific charm in this Train Movie ( as opposed to the classic Road Movie) that combines the impressionist camera of Olmi, the topographic precision of Kiarostami and the social preoccupations of Loach. Abbas Kiarostami was one of the most influential and controversial post-revolutionary Iranian filmmakers, as well as one of the most highly celebrated directors in the international film community of the last decade. Although Kiarostami made several award-winning films early in his career, it was after the revolution that he earned a highly esteemed reputation on the stage of world cinema. In 1990, Close-up, which many considered his masterpiece, and later, the poetic Life and Nothing More established his international reputation and gained him the Roberto Rossellini Award for the Film Career at the 45th Cannes International Film Festival in 1992. Kiarostami next won acclaim for Through the Olive Trees, which was screened in competition at the 1994 Cannes Festival. In 1997, he was awarded the prestigious Palme d’Or award at the Cannes International Film Festival for his film Taste of Cherry. Another unconventional meditation on everyday life rooted in a humanist philosophy, The Wind Will Carry Us won the Golden Lion at the 1999 Venice Film Festival. In 2002, after several years dedicated to script-writing and documentaries, Kiarostami returned with the Palme d’Or nominated drama, Ten. Ken Loach was born in 1936 in Nuneaton. He attended King Edward VI Grammar School and went on to study law at St. Peter’s Hall, Oxford. After a brief spell as an actor, Loach was recruited by the BBC in 1963 as a trainee television director. This launched a long career directing films and documentaries for television and the cinema, from Cathy Come Home and Kes in the Sixties to Land and Freedom and Sweet Sixteen in recent years. Ermanno Olmi was born in 1931. He got his first job at Edison Volta: a big energy firm where he organised the company’s cinematographic service, directing – between 1953 and 1961 – approximately thirty documentaries. He made his debut in full-length feature films with “Time Stood Still – Il tempo si è fermato” (1959). International recognition came two years later with “The Job – Il posto” favourably received by the critics. From 1963 to 1975, he directed various features which confirmed him as one of the leading talents of post neo-realism Italian cinema. It was in 1977 that Ermanno Olmi found the inspiration of his best days in the harmonious structure of “The Tree with the Wooden Clogs – L’albero degli zoccoli” (1977), winner of the Palme d’Or at the Cannes Film Festival. Olmi returned in 1987, directing “Long Live the Lady! – Lunga vita alla signora!”, which was awarded the Silver Lion in Venice. He received the Golden Lion the following year with “The Legend of the Holy Drinker – La leggenda del santo bevitore”, a lyrical adaptation by Tullio Kezich and the director himself and Joseph Roth. His latest works, some of which include “Profession of Arms – Il mestiere delle armi” (2001) and “Singing Behind Screens – Cantando dietro i paraventi”, mark his return to the peak of inspiration. Both films were successfully presented at the Cannes Festival.